In a special section of the January 17 edition of The Economist, Edward Lucas gives a broad overview of the world energy outlook and the future for renewable energy. His is an optimistic forecast for cleaner, cheaper and more plentiful energy. His article can be found online here. This picture doesn’t present a very optimistic view. Almost 60% of energy production is “wasted energy.” Oil still provides 33% of all energy consumed, while wind supplies only 1.1%, and solar only 0.2%. 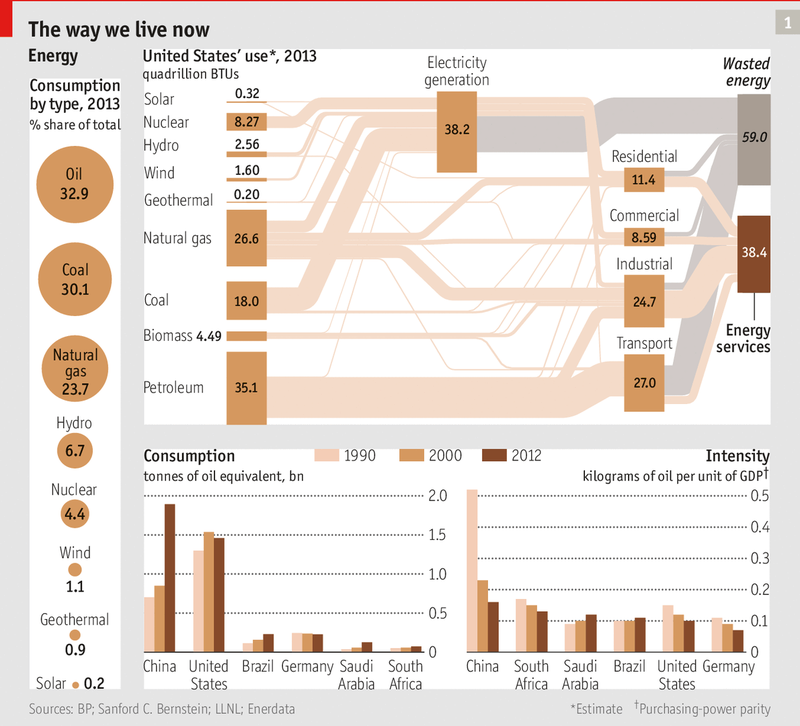 And the EIA projects that global demand for energy will increase by 37% in the next 25 years. But Lucas says things are changing. Solar electricity, and ways of storing it, are becoming cheaper and better. China invested $56 billion in renewable energy in 2013, and it installed 13 gigawatts of solar, more than its new fossil-fuel and nuclear capacity combined. Wind now provides a third of Denmark’s energy supply and a fifth of Spain’s. Solar is becoming competitive with traditional fossil fuels, and costs are continuing to decline. Lucas says solar is pulling ahead of wind. In 2013, additions of solar electricity generation exceeded that in wind for the first time. The cost of solar panels has reduced by a factor of five in the past six years. EIA predicts that solar will provide 16% of world electric power by 2050. Lucas’s five keys for the future of energy: (1) abundant energy, largely from the growth of cheap solar; (2) development of storage technologies; (3) growth of distributive energy – making consumers small producers and storers of energy; (4) intelligent use of energy – smart meters, better management of electricity distribution, “smart grids”; and (5) new business models to finance these new energy systems.